A storage shed is a long term investment, and with Cook it’s an investment that lasts a lifetime (learn about our Lifetime Warranty). But, it can also mean it’s a little outside of most families’ budgets right now. 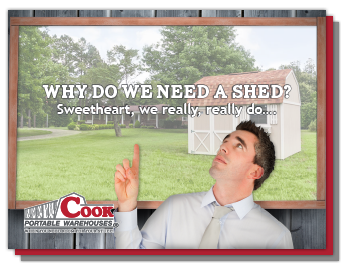 With Cook, you have the option to customize your favorite shed style while still being a part of our Rent to Own Program. This is an affordable, durable option for anyone who needs more room for their stuff. No credit check before purchase. A small deposit means your shed is delivered to your backyard in just a few weeks. Plus, delivery and setup are free! Security deposit is refundable once the principal is paid in full. Want to pay extra one month? It goes straight to paying your principal. Want to pay it off early? No penalty! Decide your shed just isn’t big enough? With our rental option, you can trade up to a larger shed without losing your investment. So, don’t be afraid to try on a particular shed for size. No hassle return policy, for any reason, without hurting your credit. In the end, you’ll OWN your storage building. If you choose the rent to own program, you will be able to change the shed’s features after your shed is paid in full. At that time you can paint, add permanent shelving or even hire an electrician to outfit your portable building. A Cook shed is your blank canvas. Make it what you need it to be. Your rental agreement and the number of months in your plan will determine the percentage of each payment that will go toward your principal balance. Discuss this in more detail with your Cook shed dealer. Which Sheds are offered in our Rent to Own Program? Why do we offer our rent to own and trade up options? Because we want to make sure you have enough “room for your stuff.” We understand the struggle of needing more space now, not months or years down the road. We build sheds that will last a lifetime, offered at a price that fits your budget today.